I think I have finally figured out a system that is improved and complete. Since I have been doing it this way for awhile (with tweaking along the way) I thought I would share with you. In the past I have ended up doubling up on photos and layouts and if I had a layout without journaling (not my favorite thing) I wouldn’t know who’s book the layout was supposed to go in. First, I go through my digital photos on the computer and determine which ones I will print. I make books for each of the kids and a family set so I go through my pictures with one book in mind at a time. So I would go through and pick out all the photos I want to scrapbook for my family book. I copy these photos into a folder on my desktop that is labeled “photos to print – delete when done”. Inside that folder I have a family one and one for each of the kids. As photo deals come up, I upload from this folder. Once uploaded, I move them to another folder (ex. Walgreens). I know these prints are on the way and within the Walgreens folder they are still sorted into family, kids, so I know where they belong. 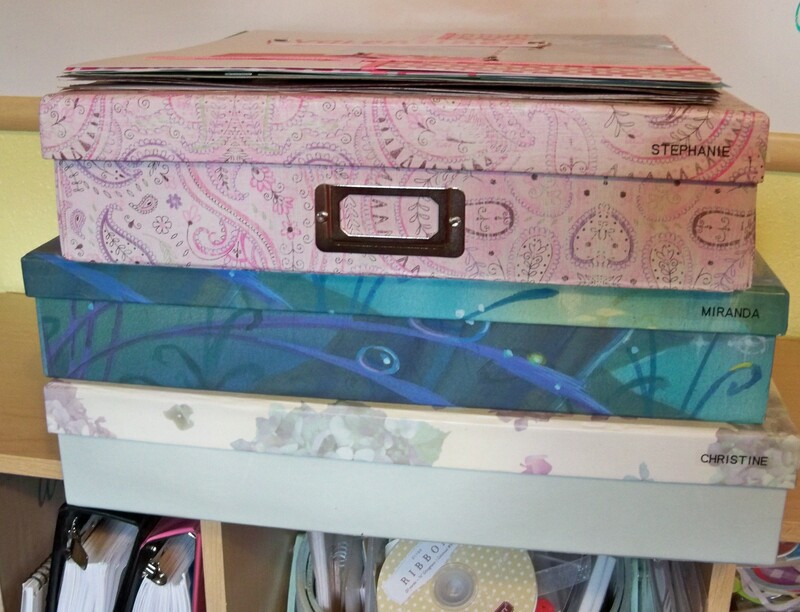 Once I receive the prints, I refer back to these folders and from here they go into a photo box with tabs labeled the same as my computer folders (family, kids). They are filed in the back and I work the oldest (front) pictures first. 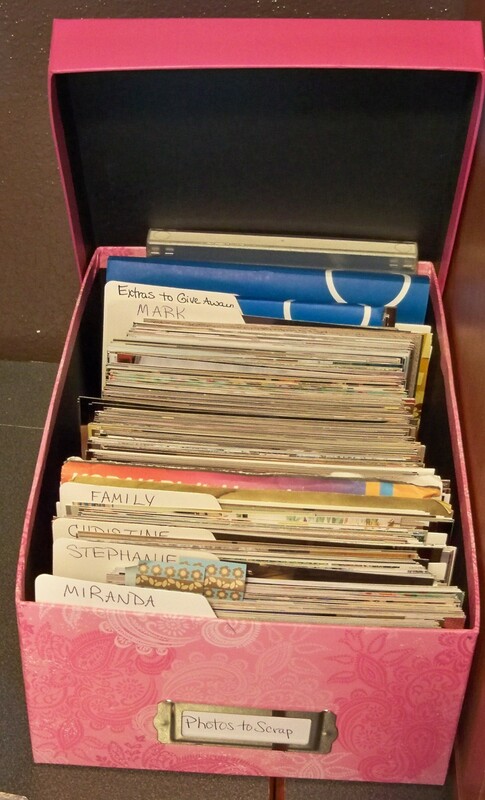 From the photo box, I will take out a set of pictures and either make a page or create a page kit. My page kits will consist of pictures, paper, embellishments, and a sketch. I have 12×12 boxes to hold the page kits. Once again, these boxes are all labeled the same (family, kids) keeping my system consistent. The boxes are then filled with pages to scrap or take to a crop. Once the pages are complete, I write on the back of the page which book it belongs in. 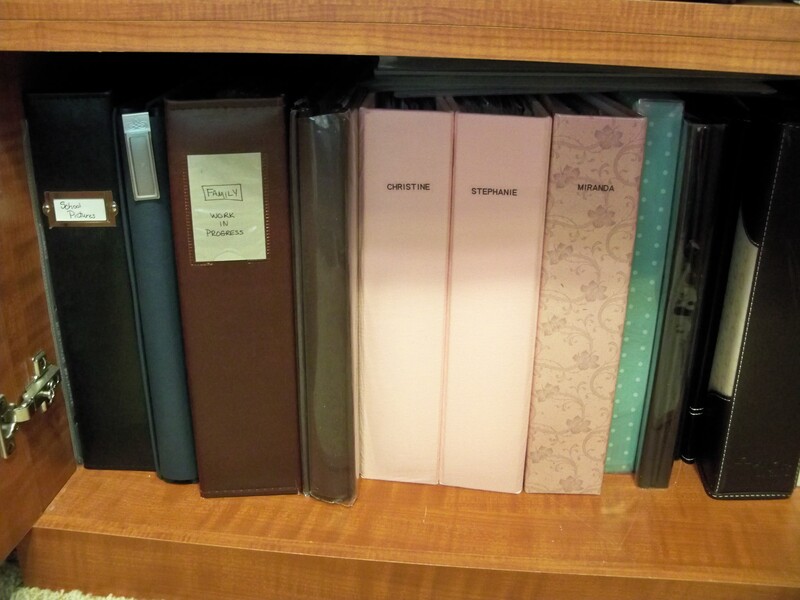 Next, I have 3-ring binders for each set of books (family, kids). Completed pages go in these books and when they are filled I move them to a post-bound album. I used to have all my pages chronological by photo dates. This was a lot of work so I’ve gotten a little slack with this and now just put them in the book as I scrapbook them. Since I do the oldest photos first and work my way to the current I figure it’s close enough.